UO biologist Jessica Green was among a small group of experts assembled recently by the White House Office of Science and Technology Policy to discuss the status of research on microbiomes, complex systems of microorganisms that inhabit our bodies, homes, cities, forests and oceans. The event coincided with the launch of the the National Microbiome Initiative, a call to action to advance microbiome science. It highlighted changing attitudes toward microbiomes and a new view of the biological world, recognizing that communities of microorganisms are all around and play crucial roles in defining the health and integrity of their hosts. The Obama administration announced steps to advance understanding of microbiomes and their influence on human health, climate change, food security and national security. Green presented research from the UO’s Biology and Built Environment Center, known as BioBE, examining the relationship between architectural design and the indoor microbiome and emphasized potential implications for human health and other areas, including forensics. Green also highlighted work by Erica Hartmann, a postdoctoral researcher in the UO center. In a related article co-authored by Green that appeared in the journal mBio, researchers called for an increased investment in microbiome-based solutions to 21st-century challenges. “Given the extensive influence of microorganisms across our biosphere, we propose that a coordinated, cross-disciplinary effort is required to understand, predict and harness microbiome function,” researchers wrote in the article. 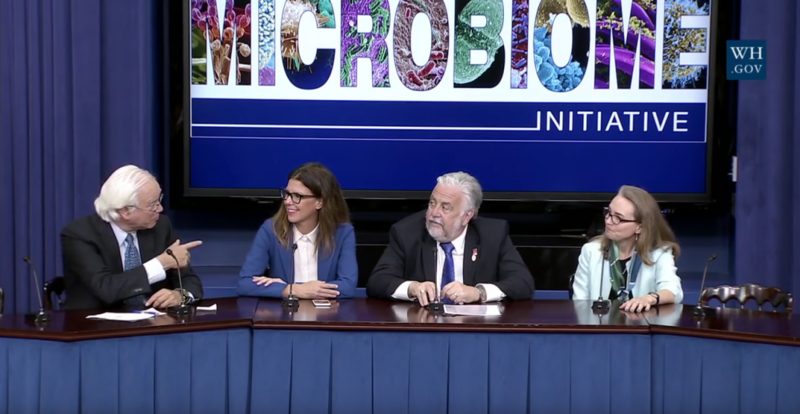 At the White House event, speakers outlined the National Microbiome Initiative, including the more than $920 million in federal investments over the past three years and future commitments for $120 million in new government-supported research for 2016-17 and $400 million in new commitments from nongovernment groups. Green was joined on the panel by Samantha Joye, professor of marine sciences at the University of Georgia; Tim Donohue, professor of bacteriology at the University of Wisconsin-Madison; and Marty Blaser, Muriel and George Singer Professor of Medicine at New York University. In October 2015, Green joined a consortium of U.S. scientists in co-authoring a policy paper published in Science magazine calling for new research tools and collaborations to unlock the secrets of Earth’s microbial communities. UO President Michael Schill provided a letter in support of Green and the White House initiative. To watch a video of the kickoff event for the National Microbiome Initiative, visit the White House YouTube channel at https://is.gd/F2I4N9.